LeMessurier, William J. (1976). 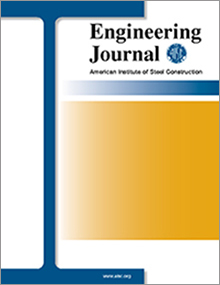 "A Practical Method of Second Order Analysis Part 1; Pin Jointed Systems," Engineering Journal, American Institute of Steel Construction, Vol. 13, pp. 89-96. MOST DESIGNERS were trained in methods of structural analysis which assume that the change in shape of a structural system due to loading does not significantly affect the magnitude of the internal forces of the system. Except for consideration of local effects such as buckling of individual columns or beams, knowing the absolute stiffness of members in relation to loads has generally been unneccessary for determining the internal forces of a system. The method discussed here was developed for pin jointed structures without bending moments. It gives exact results within the limitations of small deflection theory. In a continuation of this paper, to be published in the AISC Engineering Journal in the near future, the method will be extended to include frames with bending moments.